Star clusters are a group of stars that are attracted to each other by their gravitational fields or are moving in the same direction. Star clusters were used to be called star clouds. There are two kinds of star clusters, the open star cluster and the globular star cluster. Open star clusters are loosely clustered groups of young stars. The gravitational attraction between the stars may be weak or non existent. Globular star clusters are made up of hundreds of thousands of very old stars that are gravitaionally bound. These stars are attracted to each other and form a very tight sphere. The stars within a globular star cluster orbit a galactic core and the amount of stars within get denser going toward the center. There are about 160 known globular clusters in the Milky Way. The Andromeda galaxy has 500 while Galaxy M87 has 13,0000. The first discovered globular star cluster was M22 in the constellation Sagittarius by Abraham Ihle in 1665. 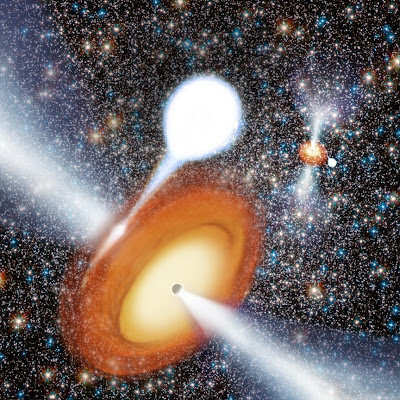 The image above is an artist's conception of two black holes in globular cluster. Image credit goes to Benjamin de Bivort; Strader, et al. ; NRAO/AUI/NSF. An unexpected discovery by astronomers using the National Science Foundation's Karl G. Jansky Very Large Array (VLA) is forcing scientists to rethink their understanding of the environment in globular star clusters, tight-knit collections containing hundreds of thousands of stars. The astronomers used the VLA to study a globular cluster called Messier 22 (M22), a group of stars more than 10,000 light-years from Earth. They hoped to find evidence for a rare type of black hole in the cluster's center. They wanted to find what scientists call an intermediate-mass black hole, more massive than those a few or more times the Sun's mass, but smaller than the supermassive black holes found at the cores of galaxies. "We didn't find what we were looking for, but instead found something very surprising -- two smaller black holes," said Laura Chomiuk, of Michigan State University and the National Radio Astronomy Observatory. "That's surprising because most theorists said there should be at most one black hole in the cluster," she added. Black holes, concentrations of mass so dense that not even light can escape them, are left over after very massive stars have exploded as supernovae. In a globular cluster, many of these stellar-mass black holes probably were produced early in the cluster's 12-billion-year history as massive stars rapidly passed through their life cycles. Simulations have indicated that these black holes would fall toward the center of the cluster, then begin a violent gravitational dance with each other, in which all of them or perhaps all but a single one would be thrown completely out of the cluster. "There is supposed to be only one survivor possible," said Jay Strader, of Michigan State University and the Harvard-Smithsonian Center for Astrophysics. "Finding two black holes, instead of one, in this globular cluster definitely changes the picture," he said. The astronomers suggest some possible explanations. First, the black holes themselves may gradually work to puff up the central parts of the cluster, reducing the density and thus the rate at which black holes eject each other through their gravitational dance. Alternatively, the cluster may not be as far along in the process of contracting as previously thought, again reducing the density of the core. "Future VLA observations will help us learn about the ultimate fate of black holes in globular clusters," Chomiuk said. The two black holes discovered with the VLA were the first stellar-mass black holes to be found in any globular cluster in our own Milky Way Galaxy, and also are the first found by radio, instead of X-ray, observations.